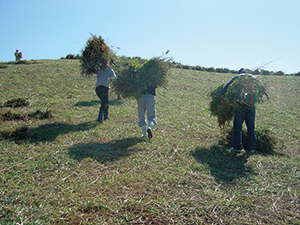 For many years, Aso's grasslands have been maintained by people through such activities as pasturing, controlled burning, and mowing. However, it has become difficult to conduct controlled burning due to the shortage of successors and decrease of cattle herders, resulting in more bushes and woods and less grassland areas. 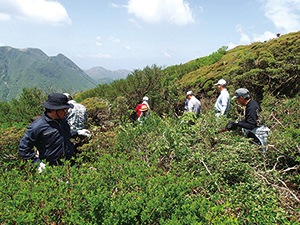 Currently, "Aso Grassland Restoration Committee" are making efforts to restore Aso's grasslands in cooperation with local people and organizations. The huge community of Rhododendron kiusianum in Kuju Mountain Range was once scenery representing the area. In recent years, however, because of the overgrowth of bushy trees such as the panicled hydrangea, it is apparent that the community has been confined and declining. Therefore, under a revised management plan, related organizations are jointly conducting activities of cutting such trees for their conservation in spots including the special protection area.